The Nani Museum project aims to create a create a complete census of the Greek and Latin inscriptions that once belonged to the Nani collection. The latter was a private collection of antiquities put together by the two brothers Bernardo and Giacomo Nani in Venice in the 18th century. The Nani Collection once included at least 98 Greek and 107 Latin inscription. For each entry, the digital archive will list its origin and its present location. 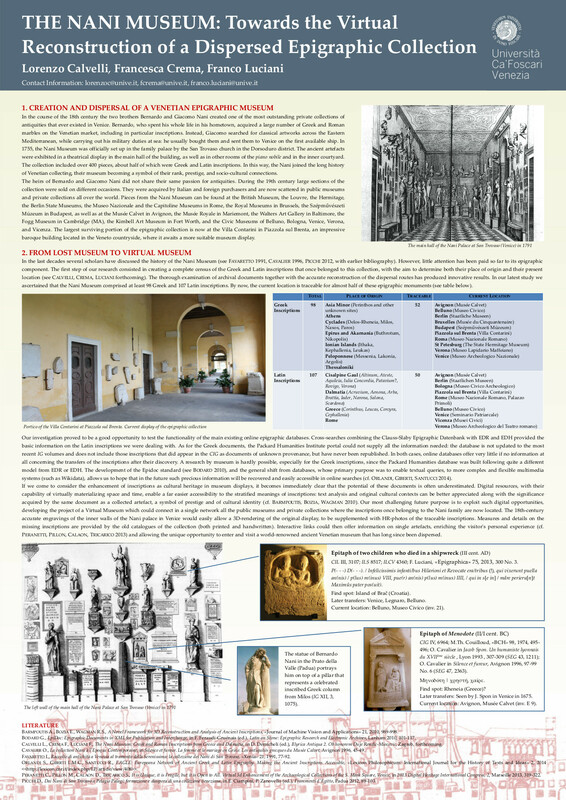 Lorenzo Calvelli, Francesca Crema, Franco Luciani, The Nani Museum:Towards the Virtual Reconstruction of a Dispersed Epigraphic Collection, a paper presented at the EAGLE2014 Conference. This page was last modified on 14 January 2016, at 12:22.